Fortis Inc. ("Fortis" or the "Corporation") (TSX:FTS)(NYSE:FTS) today received the 2017 Governance Gavel award from the Canadian Coalition for Good Governance ("CCGG") at a ceremony in Toronto. The award was presented for "Best Disclosure of Corporate Governance and Executive Compensation Practices" in 2017. On hand for the ceremony were Stephen Erlichman, Executive Director, CCGG; Ron Munkley, Chair of the Governance and Nominations Committee, Fortis Board of Directors; and, Barry Perry, President and Chief Executive Officer; Nora Duke, Executive Vice President, Corporate Services and Chief Human Resource Officer; and David Bennett, Executive Vice President, Chief Legal Officer and Corporate Secretary, all of Fortis. 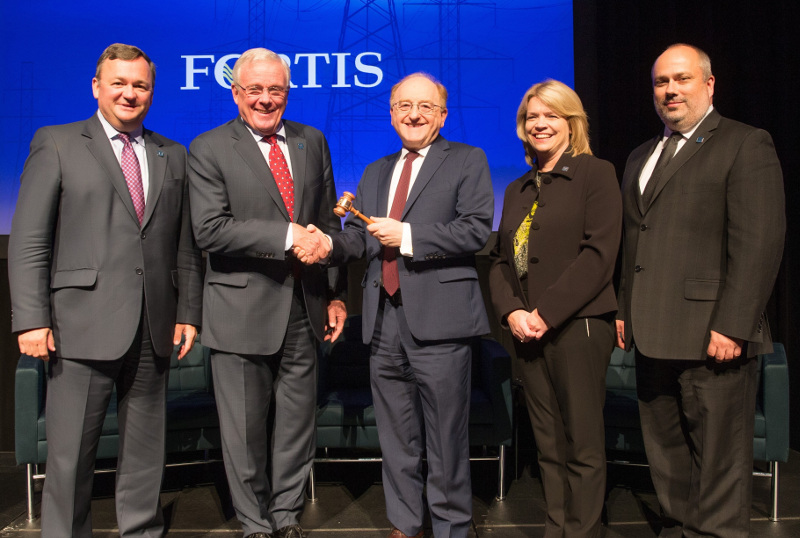 "Fortis is a strong advocate for good governance," said Board Chair, Doug Haughey. "We are mindful of the expectations of our shareholders, and continue to advance our communication accordingly." Mr. Haughey thanked CCGG for considering Fortis a leader in this field. In identifying nominees for a Governance Gavel award, CCGG considers those issuers with whom a board engagement was conducted during CCGG's recently concluded engagement season. CCGG members also may nominate an issuer for an award. "CCGG congratulates Fortis on being one of the two winners of our 2017 Governance Gavel Awards. The award recognizes Fortis for its leadership in disclosure practices relating to corporate governance and executive compensation," said CCGG Executive Director Stephen Erlichman. The Governance Gavel Awards were introduced by CCGG in 2005 to recognize excellence in shareholder communications by issuers through their annual proxy circulars.